While there are many brands of gopher poles or push pull poles on the market, time and again, the preference seems to be the Crane 95020 Gopher Pole. The Crane 90520 gopher p0le or push pull pole is telescopic, 52″ while collapsed and extends to 22 feet and weighs under 4 lbs. Some of bigger electrical supply houses have moved away from the Crane Gopher pole for lines such as Greenlee and others, but still ask the contractors and they will tell you they prefer the Crane 90520. One real plus the telescopic design offers is when you are on the ladder, you have the complete tool with you and you can feed it out rather than fumbling with sections screwing them on then adding another length and so on. 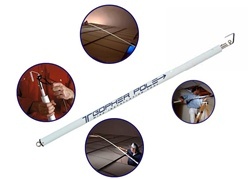 If you have never tried a Gopher 90520 push pull gopher pole, give it a try and see why it has been preferred gopher pole for years.